What would you give to get exactly what you wanted? Would you give your opponent a Prize? Maybe 2? How about ending your turn? Would that be too much? Pokemon has been asking the question for a while now, usually presented in the form of a Pokemon attack or a mechanic like Mega Evolutions, but it’s not often that it comes up on a Supporter. Steven’s Resolve is one such Supporter, letting you add any three cards to your hand but at the cost of ending your turn. It’s not unlike Milotic (DRX), who had to use an attack in order to grab 3 cards, which still lead to you ending your turn without doing anything else, the main difference between the two being that Steven doesn’t require a Stage 1 Pokemon to have an Energy attached to themselves to get the effect. Now no card with a heavy restriction would be complete without some way of getting around it, which Steven’s Resolve does in the form of Metagross from this set. Metagross’s Extend Ability says that you don’t have to end your turn after you play Steven’s Resolve, so long as it’s your Active Pokemon. That’s not too bad of a deal, given the 170 HP body it has attached to it, but it doesn’t seem like it’s worth it to set up a Stage 2 Pokemon just so you can get around the negative of the card itself. So will Steven’s Resolve see play without Metagross? It’s entirely possible; depending on how slow things are, it may actually be worthwhile to start off with grabbing 3 cards out of your deck. It’s what makes Steven’s Resolve a really good early game card in particular, especially on your first turn when you can’t even attack anyway. All you gotta do is play an Energy here, maybe a couple Items, throw down a Pokemon, and then play this card to add three new cards to your hand which will set you up for later turns! Pretty good stuff, actually. It probably won’t be as popular in the Expanded format, where decks are faster and N exists to create a problem for the search, but in Standard, it’s likely going to be experimented with. I don’t know how successful it’ll be, but it’s hard to deny its early-game impact is incredibly solid. Arora Notealus: Steven’s Resolve has a lot of potential, similar to Latias <Prism> from yesterday, but it’s going to see play outside of one or two kinds of decks. Metagross isn’t a necessity to playing the card, but it does improve the card’s ability to be played later on in the game; avoiding the end-of-turn clause could end up being very important down the line. It also combos well with Latias <Prism>, since he can actually retrieve the card from your deck, thus allowing you to set-up for Dragon plays! Weekend Thought: What do you think of our list so far? Think some cards ought to be higher? See something that’s not on the list that you think should be on it? Maybe you’re not a fan that Acro Bike saw the list in place of a newer or upgraded card? Or maybe you like that it got recognition for its worth? Next Time: Another older card gets upgraded for the modern era, and it’s…a Stage 2?? Today, we’re taking a look at Steven’s Resolve (SM Celestial Storm 145/168). There was some excitement regarding this card when players first saw it. Unfortunately, I’m not too excited about it because after reading the effects, I can be certain that proper care should be taken care of if one actually wants to use that card. Not sure if it’s appropriate to mention another related card as a two-fer for this review, but I might as well include it, as it paints a bigger picture to the story of this card’s viability. Steven’s Resolve brings universal search to the game. You can search your deck for 3 cards and put it onto your hand. This could be anything, whether it be items so that you can use it right away, Energy cards if you need to attach one, or Pokémon so that you can bring reinforcements. To bring back a familiar trick, you can fetch two of any card and then a Steven’s Resolve so that you can use him next turn. I recall Cyrus’s Conspiracy did such a similar thing. Such an powerful effect would’ve been too good that not only he is a Supporter card so that you can use one of them per turn, but they also added a caveat that your turn would instantly end after you played him and searched for three cards. Let’s pause right here. Remember what I’ve said in the previous paragraph of things you can do with three cards? Everything I just said would be completely invalidated due to this clause. Instantly ending your turn means not only you can’t use the cards that you’ve just fetched right away, you also lost the opportunity to use an attack. Not only that, the cards in your hand could be at the mercy of your opponent such that they can use a card that shuffles your hand and draw a different set of cards, and it may not be the same cards that you’ve searched for. Doesn’t matter which format you’re at; Standard has Wicke, Ilima, Marshadow’s Let Loose Ability, and Judge while Expanded adds N, Ace Trainer, Delinquent, and Red Card to further disrupt your hand. Regardless of how playable those cards are that were mentioned, just the threat of those card’s existence can render Steven’s Resolve unreliable most of the time assuming your opponent does have those cards in their hand or if they have a method to fetch those cards. …except that Steven wasn’t finished with me without his signature Pokémon in tow. You see, Metagross (SM Celestial Storm 95/168) is based on Steven’s Metagross due to the artwork, and it has the attributes and effects to prove its worth. It is a Stage 2 Metal Type with 170 HP, weak to Fire, resists Psychic, and a retreat cost of 4. Its ability, Extend, states that as long as this Pokémon is your Active Pokemon, whenever you play Steven’s Resolve, your turn doesn’t end. That makes it so that you can use Steven’s Resolve without ending your turn, and you can continue to do your usual business: making use of cards that you’ve just grabbed and finally using an attack. So having some sort of ability-based Spirit Link seems nice as it addresses the only problem presented on this Supporter card, but is there any reason to use Metagross besides the ability, especially when it is on the Active spot? Actually, there is! It’s only attack Meteor Mash, costs a single Metal energy for 60 damage, and does 60 more damage if you used Meteor Mash last turn. As long as Metagross is not switched, retreated, or scooped, this attack becomes 120 damage for one Energy, which can reach 2HKO potential (and potential to OHKO any Fairy Pokemon). It’s only attack that cost one Energy also means that it is feasible to use Max Potion to flush all the damage away. Despite losing all energy attached to it, Meteor Mash is just one manual attachment away. And you can add Metal Frying Pan to the mix for removing its Fire weakness and taking 30 less damage (50 less against Psychic Pokemon due to the Tool and it’s own resistance). Is my Active Pokemon going to be safe after using Steven’s Resolve? Is my hand at risk of being shuffled or disrupted after you got the cards that you need? It is worth losing your attack and the ability to do anything else after playing Steven’s Resolve? If you’ve answered yes on the first question, no on the second question, and yes on the third question, then that’s the only moment where you can safely use Steven’s Resolve. If your answer is different than what I said, then it’s not worth using him. Things may look bleak on the bigger picture, though, with players assuming that things will happen inevitably mostly on their opponent’s next turn, like getting one of their Pokémon KOed from an opponent’s attack and messing up your strategy, their hand being shuffled most of the time and drawing random cards, and wishing that they would’ve used an attack and other cards not named Steven’s Resolve. Players who can’t mitigate the loss of one turn may steer clear from this card. Steven’s Resolve is pretty tricky to score unlike Cynthia. With Cynthia, she was used four copies regardless if Garchomp (SM Ultra Prism 99/156) was used or not. So she was already a great card to begin with. With Steven’s Resolve, one can’t ignore the glaring weakness of losing your turn, despite being able to search three of any card. It is also hard for me to score because he is a staple for a particular deck (like running four copies of Steven’s Resolve in a Metagross deck) while others may be used either one or two copies. This would mean a small bump on both Standard & Expanded. Expanded is going to be worse, though, with many ways to disrupt your hand, whether it be the VS Seeker/N combo or obscure Judge/Red Card/Delinquent, your hand isn’t safe enough without using Metagross. As for Metagross, though, Fire Weakness can still be a problem as Volcanion-EX in Expanded can easily OHKO this Pokémon due to Steam Up powering up Basic Fire attackers. And even if Weakness is not the case, as a Stage 2 Pokemon, you need to find a way to get Metagross into play, whether it be a Rare Candy, before you use Steven’s Resolve so that you can reap the benefit of continuing your turn. Don’t forget ability denial from Garbotoxin, as it can render the ability useless, making Steven’s Resolve ending your turn even if Metagross is Active. Steven’s Resolve can actually be good in the Limited Format. No Supporter comes close in regards to search power, though Lisia and Underground Expedition comes close. Most Pokemon in that set aren’t too aggressive, so you can get away with losing a turn after using Steven’s Resolve and still be safe from being OHKOed, unless the Defending Pokémon already finished their setup. And if you have Metagross, then you are set to sweep! Conclusion: Steven’s Resolve should’ve scored higher, but doing so may be misleading such that they thought I’d ignore some of its drawbacks. The drawback of ending your turn instantly should not be ignored. It’s like Professor Oak’s New Hint or Kiawe; you just play it, end your turn, and hope for the best that nothing bad happens to your setup. Although such a scenario doesn’t happen all the time (mostly the hand disruption aspect), it happens often enough that it frustrates players into thinking about Steven’s Resolve not being an investment because their current hand couldn’t stay intact for even one turn. Even I can’t give too much credit just because it could be a staple for Metagross decks. If Steven’s Resolve proved to be extremely potent than what I envisioned, then I will be happy enough to change my view on this matter while retaining some of my points, but to say it in a good way. Steven’s Resolve (CES 145) enters the meta at an opportune time. With N and Sycamore rotating out of the format at the end of August, many decks desperately want for draw Supporters to replace them and fill the several open card slots that rotation has created in many of our lists. Steven’s Resolve looks like a good potential candidate… except for the fact that your turn will probably end immediately after you play it. While N is leaving the format, Judge is not. I would expect Judge to see significantly more use in the new meta. I’m certainly running it in my Sylveon GX Gardevoir GX decklists, and I’ve crammed a couple into my Swampert decklist as well. Judge may function even more effectively than N. When I did my studies on N, the average number of cards drawn was almost five and half. Judge will usually put less cards in your opponent’s hand than they had previously. But more than just reducing hand size, Judge will also help disrupt your opponent’s strategy after any precision drawing or massive card spams (Alolan Vulpix, Plusle, Sylveon GX, Metagross GX Algorithm GX, Drampa GX Big Wheel, Rayquaza GX Tempest, etc.). We now have many different Pokemon that can draw cards as part of their attack, and Judge will help nullify their attack and potentially waste the tempo they spent putting those resources in their hand. However, Steven’s Resolve does have an exception. If you have Metagross (CES 95) in play AND IN THE ACTIVE POSITION, your turn does not end. This is asking a lot – not only do you have to invest card slots in Metagross, you have to get it up into the active position as well. Now, one of the three cards you choose could potentially be a switching card; however, that means Steven’s Resolve only really lets you grab two cards from your deck, diminishing its value by a third right there. So it’s not a terribly improbable combo, Steven’s Decision and Metagross, but it has a lot going against it. You have to invest in getting Metagross evolved and into the active position. You have to get Steven’s Resolve when you have Metagross in the active. You also have to grab a switching card if you’re not intending on keeping Metagross in the active as an attacker. IMO the cost benefit analysis just isn’t there. Maybe if you were able to hand pick four or five cards, but three just isn’t enough. My suggestion is that you resolve not to play this card. Appearing in two personal top 10 lists and one top 25 to score 65 voting points, and after losing the tie-breaker with next Monday’s card, our sixth place finisher is Steven’s Resolve (SM – Celestial Storm 145/168, 165/168). This Trainer-Supporter allows you to add three cards of your choice to your hand from your deck, and then your turn ends. That is a very potent effect mixed with a very big drawback. Metagross (SM – Celestial Storm 95/168) has an Ability that keeps your turn from ending when you play Steven’s Resolve, but… I’m honestly not sure if it is worth it, except perhaps in a Metagross-GX deck that has a lot of ways of changing out its Active. Claydol (SM – Celestial Storm 79/168) has an attack that does damage based on how many Steven’s Resolve are in your discard pile but… it isn’t a good enough attack, to be blunt. No, Steven’s Resolve was my personal 8th place pick for its general use post rotation. 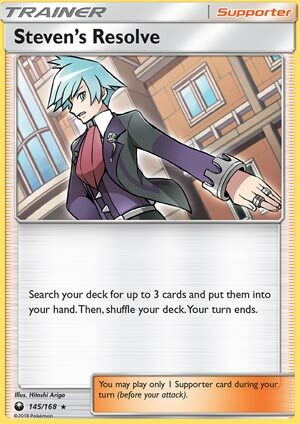 Prior to rotation, as well as in the Expanded Format, you’re begging for your opponent to hit you with N. Sure, you may have played your hand down to just Steven’s Resolve before using that Steven’s Resolve to have the perfect three card hand but under those circumstances, you could use Professor Sycamore to draw seven cards or Lillie to draw six (eight if it is your first turn) and still have the rest of your turn to use some of what you just drew (and attack if it isn’t the first turn of the game). After the rotation, your opponent can’t hit you with N. Sure, your opponent might use an alternative like Judge, but using Judge on your first or second turn can be pretty risky; this is usually when you need one very specific card or just a large hand to get your field ready. Come September 1st, we also won’t have Brigette as the go-t-T1-play for a lot of decks. Lillie is still an option, and nothing says you can’t run both as Lillie has some merit later on (unless your hand is just too large) while Steven’s Resolve… actually, it too still has some use though it is much more narrow. Not the picking of the three cards, that is often still great. The issue is being in a situation where it is worth giving up your Supporter and functionally giving up your attack and the rest of your turn to get the exact three cards you think you’ll still need next turn. I wouldn’t call that likely, but sometimes it’ll happen. In some ways, Steven’s Resolve is reminiscent of Tropical Beach, but before any one worries, yes I realize that a Stadium you can use in addition to your Supporter for the turn is a big difference from a Supporter that ends your turn. Like I said, I only had Steven’s Advice as my 8th place pick. I think it is good for SM-On Standard, but not great; it might become a one-off for all decks, but probably a one or two-of for slower decks. In Expanded, I don’t expect to see it unless a particular lock deck makes good use of it or Metagross becomes a big deck (I am allowing for but not expecting either). For the Limited Format, it is a must run, though I cannot quite bring myself to give it a perfect score; if you don’t have a turn to spare after using it, the search comes too late and if you have nothing but filler in your deck, it isn’t much better than drawing three off the top like Hau.